Is the Netsol Technologies (NTWK) team worth investing in? NetSol Technologies Inc. (NASDAQ:NTWK) provides IT and enterprise application software and solutions for the global financing, leasing and lending industry. NTWK was founded in 1997 and is headquartered in California. The company also has significant operations in Lahore, Pakistan, as it conducts the majority of it’s business in Asia. Despite a micro market capitalization of only $42.70M, NTWK works with Dow Jones 30 Industrials, Fortune 500 manufacturers and financial institutions. The company’s operations are primarily centred in Thailand, China, Pakistan and Australia – though it also has offices in London and California. This article discusses the merits and risk of a common stock investment in NTWK, given current conditions and market perceptions. Netsol Technologies Inc. helps companies use IT solutions to streamline their business. The main product offered by NTWK is NetSol Financial Suite (NFS). NFS drives cost reduction in client businesses by providing end-to-end management of their credit portfolio. This flexible web-based product has helped companies like BMW expand their operations into new markets, and scale for continued global growth (especially in Asia). On October 24 2013, NTWK announced the soft launch of their next generation platform NFS Ascent – the most advanced platform in the industry. NTWK’s portfolio also includes the Smart Open Catalogue Interface (SmartOCI) which is an innovative search engine technology that allows corporate buyers and shoppers to browse multiple supplier catalogs within the SAP CRM system. In addition to the products listed above, NTWK also offers a wide array of support services. Going forward, NTWK’s success depends on the company’s ability to grow revenue and improve profits, capitalize for growth worldwide, penetrate North American markets and continue to streamline sales and marketing operations. Per management’s commentary in their 12/31/13 quarterly filing, they remain optimistic about this progress and are aggressively pursuing their growth goals (more on that later). Management states most risks to NTWK are macroeconomic in scope. And while investors are wise to consider these risks, they are not company specific. Regional geopolitical risks in Pakistan are also worth mentioning. NTWK is a globally integrated company with offices in London, Bangkok, Beijing, and Lahore. NTWK leverages this global footprint using a “Best Shoring” approach to help clients and potential customers find the best possible solution and price for their unique situation. NTWK combines this domain expertise with competitive cost blended rates from its “center of excellence” in Pakistan, and other global offices. This unique and cost effective global development model adds value by keeping costs low for global clients without compromising quality. Another determining factor that makes NTWK’s offerings more appealing to customers are the ISO 9001, ISO 27001, and SEI CMMI Maturity Level 5 (V1.2) assessments; a distinction shared by fewer than 140 companies worldwide (reference). This further establishes market credibility for the relatively small technology company. NTWK’s release of NFS Ascent in October 2013 is also notable, because this offering is the most technologically advanced solution for the auto and equipment finance and leasing industry. The n-tier service-oriented architecture allows the system to scale quickly. The company also claims this advanced technology has helped it attract top talent, who are eager to work on the complex software engineering challenges that accompany these advanced offerings. It’s encouraging that attracting top talent while keeping head count costs low is a priority for management. Now that you’re familiar with the product, let’s talk about how NTWK makes money. NTWK is a global software company that derives revenue from software license fees, maintenance fees and service fees. Total revenues for the 3 months ended December 31 2013 were $8.7M, with the majority of income coming from services. Investors may be wary that this recent revenue number is a 26% decrease from the year prior. Why the shortfall? NTWK management claims this decrease is because current customers are delaying licensing renewals to wait for the official launch of NFS Ascent. If this is true, NTWK will realize a significant revenue backlog in the coming months. To be sure, NTWK still has a large number of customers using the old NFS platform and it expects to continue to collect some revenue from the old platform for a few more years to come. In the most recent conference call, management indicated it expects maintenance revenue to trend steadily higher and for service revenue to remain steady. The company is well-capitalized for this transition period, while NFS Ascent is rolled out to existing and new clients. The capital position is important to note because NTWK is under some margin pressure as it grows headcount to support rapid growth goals. NTWK is riding the software-as-a-service trend, providing web-based tools to help companies streamline their operations on a global scale. NTWK is far from the first company to deliver this type of IT solution. And management still sees exciting opportunity ahead. All this talk is great. But can NTWK back up the numbers? NTWK is a relatively small company, but it has been in operation for over 30 years. And during that time it has developed a robust client base, including “150 satisfied clients in over 30 countries and 250 implementations globally.” These clients include companies such as IBM, Baxter Healthcare and a number of other globally recognized brands. More information on customers is available in the NTWK company profile. Given the complexity and advanced functionality of the NFS platform and the five applications contained therein, NTWK customers are inclined to renew their software license, rather than shifting providers. The complex integration and deployment of enterprise software solutions means that once NTWK wins an account they are likely to continually generate revenue from that client for years to come. While NFS earned a modest per share loss of ($0.18) in the last quarter, this is unlikely to reflect the long term prospects for the business. Additionally, although NTWK is suffering a short-term revenue drought owing to the transition between old and new software platforms, it remains under-valued and in a strong financial position. 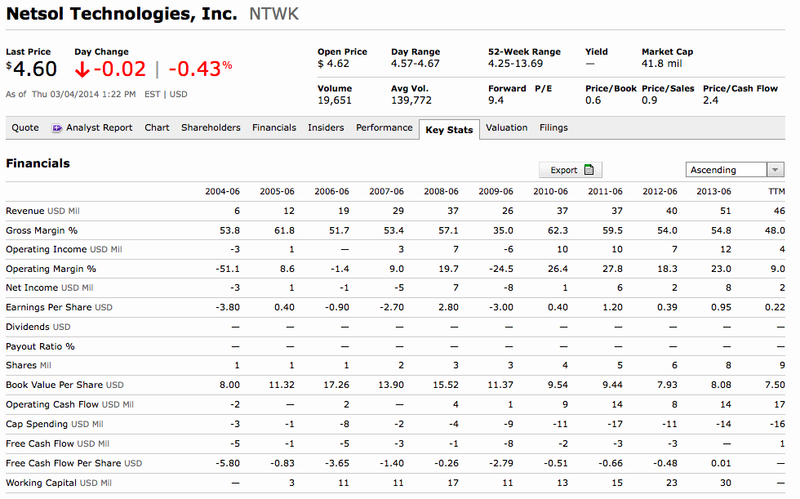 Notably, NTWK is trading at a market cap of around $42M, with around $30M in net current assets. NTWK is trading at a 40% discount to book value, and even at these depressed earnings levels it is still trading at a price to earnings ratio below 20. Per the table above the steady growth in operating income and revenue growth should give long term investors confidence, even though EPS and net income have been lumpy. How these trends play out in the next few months will be incredibly telling. That said, from a very basic discounted cash flow analysis perspective, I believe that even in the current scenario, NTWK is still undervalued. 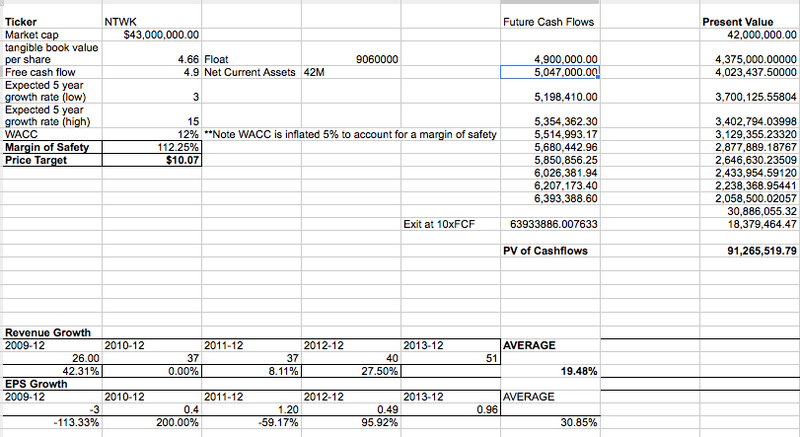 The following simple spreadsheet assumes an inflated cost of capital, and an annual growth rate of only 3%. Based on the earnings history and the narrative from management I believe these assumptions to be very, very conservative. The above analysis shows that even if cash flows only grow at 3% a year and WACC is inflated the stock still has an intrinsic value closer to $10, presenting approximately 100% upside from the current price. Even if you reduce the exit multiple by 50%, NTWK would still be about 30% undervalued. The consensus view on NTWK seems to be “we’ll believe it when we see it.” The market is discounting NFS Ascent revenues because the transition to the platform has been slower than anticipated. In fact, NTWK has been developing NFS Ascent for over 4 years! No wonder market participants are getting a little impatient. From my perspective, this inability to quickly roll-out the new software program has caused revenue to come in shy of expectations. The CEO indicated as much in the November 8, 2013 earnings report. The revenue contraction along with higher operating costs (due to headcount growth) was seen in decreasing margins and was a catalyst for underwater investors to dump the stock, as evidenced in the chart below. As you can see the stock price of NTWK has taken a bad hit, declining from over $13 dollars to a low of around $4.25. It seems quite possible the selling in NTWK was exacerbated by end of year tax-loss selling, in addition to the November earnings miss. Over the last few months however, it seems that NTWK has attempted to carve out a bottom. While this bumpy process is far from over (and the stock is still dealing with declining major moving averages), bulls should be encouraged the stock is not moving lower. Insiders of the company also own almost 10% of the stock, and insiders and institutions alike have continued to accumulate share of NTWK (reference). It is my contention that patient investors who are interested in small cap opportunities may benefit from an investment in NTWK. Of course patience is required, and this bottom might not be THE bottom. But if the company can effectively roll out the Ascent platform revenue should grow according to management’s plan, and shareholders might see capital appreciation as well. Even if the growth plans come up short, our analysis above shows even with very modest revenue growth NTWK is still significantly undervalued. Of course, an investment in NTWK isn’t without risk. For full disclosure’s sake I am long a small position of NTWK from around current price levels. I am keeping my position size modest due to the following risks. NTWK has a strong track record of performance over the last couple of decades. And it seems dedicated to further servicing customers with quality products and custom-implementations. But this investment doesn’t come without risk. The slow deployment of NFS Ascent remains a large red flag for many investors. If you’re looking for a really quick return you may want to pass on NFS Ascent. Because while it’s possible the company will begin rolling out the new platform with success, you should also be prepared to wait a quarter or two in case these operations take longer than expected (as has historically been the case). That’s a big reason I haven’t stepped up my investment. Another one of the risks facing NTWK is an inability to penetrate the North American market. Currently, the company generates around 80% of revenues from operations in Asia. Unfortunately, NTWK faces increasing competition from low-cost competitors in China putting further pressure on margins. Management is planning to drive growth in North American markets to improve margin performance. But we’ve yet to see much in the way of results there. Finally, especially skeptical readers will note the company recently changed CFO’s. This is likely due to an accounting irregularity which has been covered in-depth here and here. I think this is a case of a small company outgrowing it’s books. But diligent readers will want to review this information for themselves. In conclusion, NTWK presents an interesting opportunity for patient investors looking to see capital appreciation in the next six-twelve months. This is not a recommendation to buy or sell any security mentioned in this article and I encourage you to do your own research if you’re interested. And By The Way: If you’re curious to learn more about how I analyze companies, I encourage you to sign up for my free ebook below. You’ll also get weekly updated with tips and resources to help you improve your approach to the stock market. This entry was posted in Stock Ideas and tagged ntwk analysis, stock analysis on April 3, 2014 by Jworthy.